Picking up where Rose Gold left off in LA in the late 1960s, Ezekiel “Easy” Rawlins finds his life in transition. He’s ready to - finally - propose to his girlfriend, Bonnie Shay, and start a life together. And he’s taken the money he got from the Rose Gold case and has, together with two partners, started a new detective agency. But, inevitably, a case gets in the way: Easy’s friend Mouse introduces him to Rufus Tyler, a very old man everyone calls Charcoal Joe. Joe’s friend’s son, Seymour (young, bright, top of his class at Stanford), has been arrested and charged with the murder of a white man from Redondo Beach. Rufus tells Easy he will pay and pay well to see his nephew exonerated, but seeing as how Seymour was literally found standing over the man’s dead body at his cabin home and the racially charged motives behind it, that might prove to be a tall order. The First Walter Mosley novel I ever read was DEVIL IN A BLUE DRESS. It was 1996. I was supposed to be working on my MA dissertation, which funnily enough, was about detective fiction. I was writing about Ngaio Marsh and Walter Mosley’s 1940s Los Angeles offered a break from 1940s New Zealand. Easy Rawlins didn’t seem like a detective in that book; to me he seemed like an ordinary man caught up in events beyond his control and just trying to get out alive. 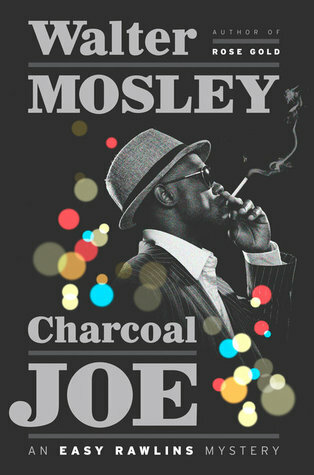 CHARCOAL JOE is the 14th book in this series. Easy’s life has moved on from a lot from DEVIL IN A BLUE DRESS. It’s 1968 and he’s asked by his dangerous friend Mouse to help the son of a friend. Seymour Braithwaite, PhD, has been found standing over two dead men…which is not a good place for an African American man to be in 1960s Los Angeles. Walter Mosley has stated in interviews that his purpose is to write stories about black male heroes. In Easy Rawlins he has done more than that – he has created a character that grows and develops as his life changes. Over the course of the series he has become a parent, fallen in and out of love and solved a number of crimes, been a private unlicensed detective, worked as a school custodian, and in this novel, a fully licensed investigator who still does favours for friends and often lives to regret it. As is common with a Mosley novel, there are twists and turns as you (and Easy) are never sure who is lying and who isn’t. Characters here come across as real people and Easy is embedded in his community, picking his daughter up from school, giving advice to friends and being involved in the odd shootout. I’m a fan of noir and especially of Dashiell Hammett, but Mosley is more of a realist novelist than Hammett. Easy has a life beyond his job that makes you want to read more. In this novel Easy is coming to terms with the end of a relationship and to his surprise has no bitterness, just a desire to do the right thing. The sense of time and setting here is a major part of the story. As you read you get a real feel for the 1960s. For Easy, who has spent most of his life exposed to racism, meeting people who accept him for himself is still a novelty. He navigates his way through a social world that is evolving and seeks to understand who he is as he solves crime. 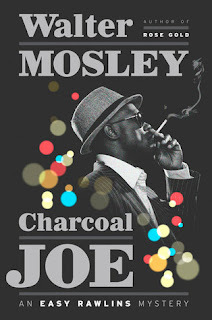 Mosley is a prolific writer and CHARCOAL JOE sees Easy assisted by Fearless Jones, lead character of three other Mosley novels (the last of these appeared in 2006). A strength of Mosley is that he has a large cast of characters; each is unique and fully formed. As a prose stylist he is sparse but each sentence packs a punch. If you’re looking for a something new to read, any detective novel by Walter Mosley is worth your time.